L 5 1/4″ (13 cm). High “dee-chip” given in flight. Also gives a series of varying “tweet” notes. 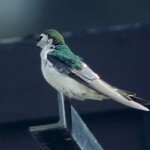 Description: Dark metallic bronze-green upperparts; iridescent violet rump and tail; slightly forked tail; white underparts. 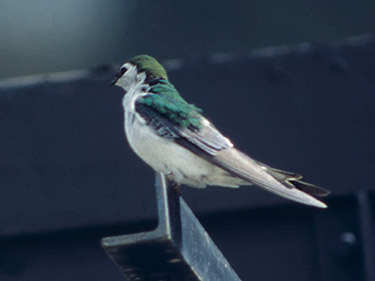 White cheek extends above eye, and white on sides extends onto rump. Female is duller above than male. Juvenile is gray-brown above, and white areas other than the rump may be mottled or grayish. Habitat: Found in open forests such as ponderosa pine forests. 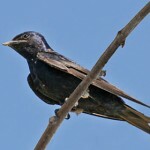 Where in Nebraska: Sometimes extends into urban areas, occasionally nesting in birdhouses. Common but local spring and fall migrant and summer resident in western Nebraska. Vagrants have appeared east to Perkins and Cuming Counties during migration. Field Notes: Outside of urban areas these birds nest in hollow trees or rock crevices, often forming loose colonies. 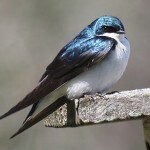 Fun Facts: A pair of Violet-green Swallow’s were once observed assisting a pair of Western Bluebirds to guard and raise the nestlings only to use the nest afterwards to raise their own young.